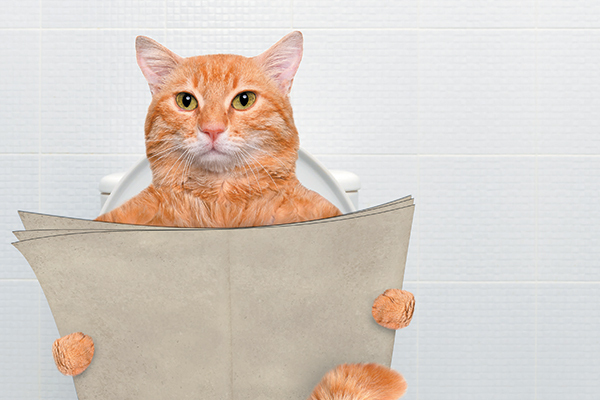 We’ve never received a sufficient explanation of why cats love to join us on the toilet. And then we realized something: It might not be just one thing. Your trip to Kohler might indulge all the senses of the cat — cat hearing, taste, sight, touch, smell — so the cat makes it his business to be a part of those trips. We thought we might interpret how each of a cat’s senses is impacted when you visit the bathroom. If we don’t, who will? Make no mistake: This is not a serious article. 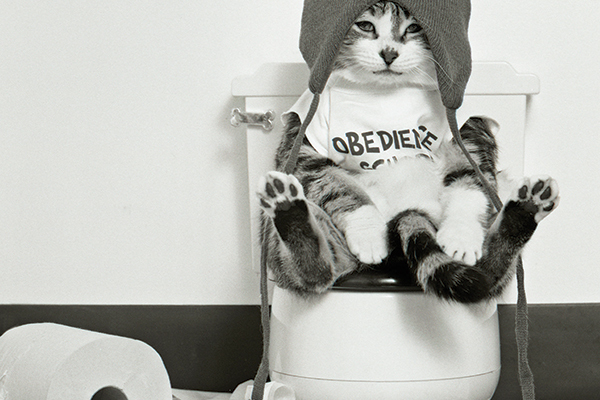 Why do cats love to visit you when you’re on the toilet? Photography ©Rasulovs | Getty Images. 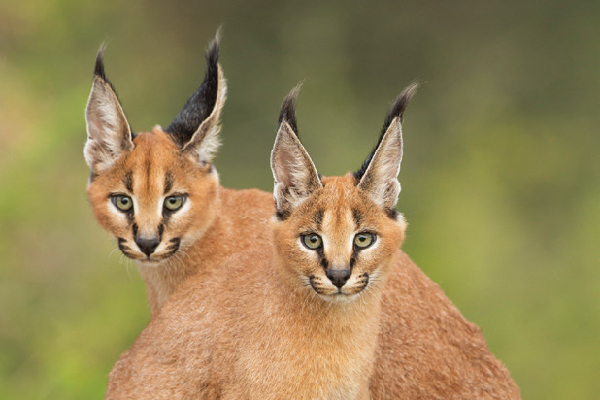 Cats love to hear things so much that they developed ears that work like periscopes, swiveling hard toward disturbances like Sean Connery locking in on torpedos (The Hunt for Red October). My deepest apologies. You may stop reading now. Q: Is your cat ever going to get over seeing you sitting on the john with your pants around your ankles? A: Never. A cat is never going to get over seeing that, that’s a priceless image to a cat, that’s the sort of image that a cat must see at every chance he gets to make sure he didn’t simply dream it up the last time he saw you there, and no matter if you use the bathroom five times a day or once a week (doctor? ), staring at the wall or God forbid reading, he’s going to be there, circling your legs and dying on the inside. And if the door is closed, he’s going to let you know it by scratching and and meowing at the door like you’re roasting a chicken and not just doing you know. Also, keep in mind that a cat sleeps as long as 18 hours a day, then lays around a little, and poops. A visit to the the litter box is a major moment in the day for a cat. He wants to experience the moment with you. It’s sort of a celebration. He’s proud of you. Cats take in much of their world by smelling it, and visiting the bathroom you with you is a huge opportunity for your cat to learn even more about what makes you tick, even if it’s after you’ve YES WE’RE TALKING ABOUT THAT DEAL WITH IT. Can you imagine all the smells associated — wait, sorry, you know full well the smells. Again, no harm if you stop reading now. Whatever gets you through the day, kiddo. Actually, after the sound has attracted her, the smell has inflamed her, and the sight of you has killed her, what’s better than a back scratch or two to finish off the experience? It’s like dessert after a good meal. Uh, we’re not doing this. In case the above didn’t fully address why your cat likes to join you in the water closet (impossible! ), maybe some of these reasons will? She thinks the thing do you with the toilet paper is hysterical. She once saw a giant snake slither out of bowl and wants to protect you. The sound of the flushing reminds her of Wai’ilikahi Falls in Hawaii. She likes your singing voice. She wants to make sure you’re getting enough water and you’re healthy and your stools are nice and round. She’s concerned about all the noises.